So I have to admit that I am a sucker for painting my nails. I'm not a super girly, prissy, high-maintenance girl, I assure you. I just have fun painting my nails. As I was painting them the other day, I wondered to myself "who came up with painting your nails?" I mean really, isn't it a little strange? So I decided to look it up. Check out what I found out- thank you to Wikipedia. By the turn of the 19th century, nails were tinted with scented red oils, and polished or buffed with a chamois cloth, rather than simply polished. English and US 19th century cookbooks had directions for making nail paints. In the 19th and early 20th centuries, women pursued a polished rather than painted look by massaging tinted powders and creams into their nails, then buffing them shiny. One such polishing product sold around this time was Graf's Hyglo nail polish paste. Some women during this period painted their nails with clear, glossy varnish applied with a camel-hair brush. When automobile paint was created around 1920, it inspired the introduction of colored nail glosses. Interesting, right? Well thank you Incas- if you are in fact responsible, because it is definitely something that I enjoy taking part in. I think I have always loved painting my nails since I was little. I remember painting my nails all sorts of colors- sometimes each finger was a different color and also had a different design on it. As you grow up, it's not quite as cool to do different designs (or so I thought) so I went with the solid colors. But now, I feel like the trends have changed and doing different designs on your nails are not just for pre-teens anymore! 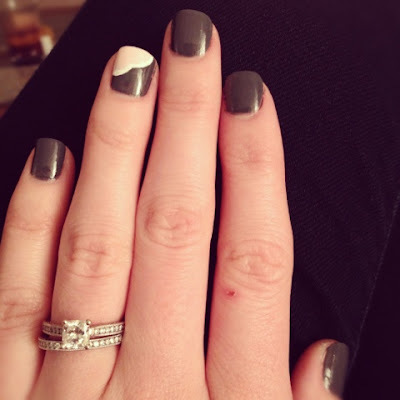 I started noticing this when the whole "paint your ring fingernail a different color" thing started becoming popular. [I would also like to know who came up with this crazy idea?] At first I was like, okay- that's weird. But now I have totally jumped on the bandwagon- It's fun! Maybe because it reminds me of when I was younger and put way more effort into making a cool unique design on my nails, but either way- I'm digging it. Now that I have joined the world of Pinterest- it's like fun nail designs are all over the place. I was a bit skeptical about Pinterest prior to joining but now I am thankful because it definitely sparks all kinds of creativity; from making yummy meals, to awesome diy projects, and now to pretty nails! I have a board on my Pinterest (check out my Pinterest page!) labeled Nails I Need, where I have pinned some of the designs I find intriguing. I look forward to finding more Nail inspirations and trying them out! It may not be crafting in a typical sense, but it's another way of pushing myself to be more creative right? 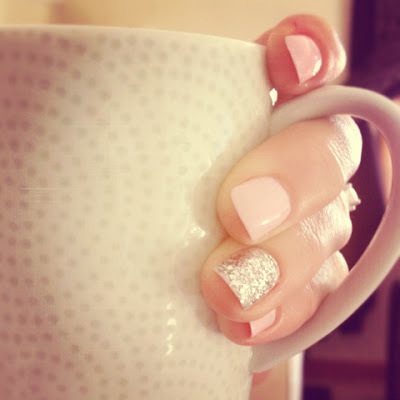 Essie brand nail polishes- not sure of the pink, but the sparkly is the Essie luxe effects nail polish. 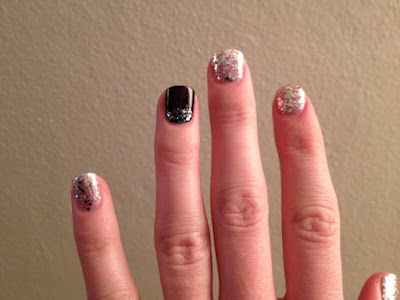 This is the same Essie brand luxe effect sparkle, and OPI Lincoln Park after Dark (has a slight purple tint to it). This nail art was inspired by thebeautydepartment.com. Check them out, they have tons of great nail, hair, and other beauty tips.